This year the Ontario Genealogical Society Conference is being held in Ottawa. There is the added excitement of the Sesquicentennial of the Confederation of Canada. The conference is being held from June 16th to 18th at Algonquin College. There are already 383 people registered. There are lodgings available at the college residence. These are filling up fast so now is the time to make your reservations. Come a little early or stay a little later to enjoy the city and festivities. There are tours available on Thursday. The Library and Archives Canada tour is sold out but you can still attend the Canadian War Museum and Ottawa Public Library tours. Sign up early to avoid disappointment. The British Pub night is already sold out. On Friday there are workshops being presented in the morning and afternoon. I am presenting “From Canada to Ireland: Researching Here and There” and it is sponsored by the OGS Irish Special Interest Group. 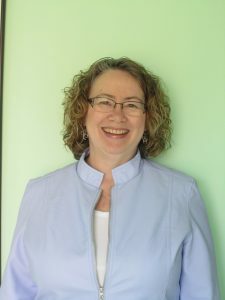 The workshop entitled “Think Like a Genealogist: Creative Research Techniques to Help You Follow the Right Ancestral Trail” is already sold out. The Keynote Lecture on Friday night will be presented by David Obee. Saturday and Sunday have four lectures per session. On Saturday the Opening Plenary Lecture is being presented by Danielle Manning. The Banquet Address is being presented by D. Joshua Taylor who is also presenting the Closing Plenary Lecture on Sunday. A new event this year is called “Using Ancestry Day.” Crista Cowan and Anna Swayne will be coming to OGS to present five lectures on Monday. It is a full day offering. Won’t you please consider joining us in Ottawa the third weekend of June for a fun filled family history weekend! 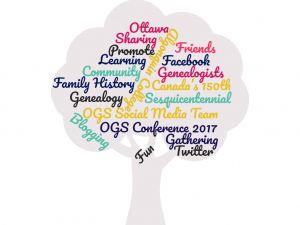 Join the Ontario Genealogical Society (OGS) Conference 2017 Social Media Team! The OGS Conference 2017 is looking for members for their Social Media Team! 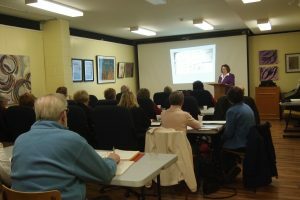 Members of all 34 branches and special interest groups of the Ontario Genealogical Society and other family historians from across North America and around the world, will meet in Ottawa, Ontario, Canada on June 16th – 18th, 2017 for three days of inspiring lectures, workshops, displays, and other learning opportunities. Our goal is to help promote Canadian bloggers, social media gurus and the genealogy community. The official OGS Conference 2017 website will have a sidebar where your blog postings will be shared as they are posted. There will be a Social Media Team Haven at the conference where we can meet, write our blog entries and post to social media. You will be accredited with an official media tag, as well as get the chance to help promote one of the largest genealogy conferences in Canada. If you are interested please send your name, blog name and URL, Twitter handle, and email address to: blog.conference2017@ogs.on.ca. Applications close on 20 January 2017. Notifications will be sent by 25 January 2017. Help make OGS Conference 2017 a huge success and celebrate Canada’s 150th birthday at the same time. Ottawa is the place to be in 2017! The Ontario Genealogical Society Conference was held from June 3rd to 5th. I also attended the OCAPG pre-conference on June 2nd. 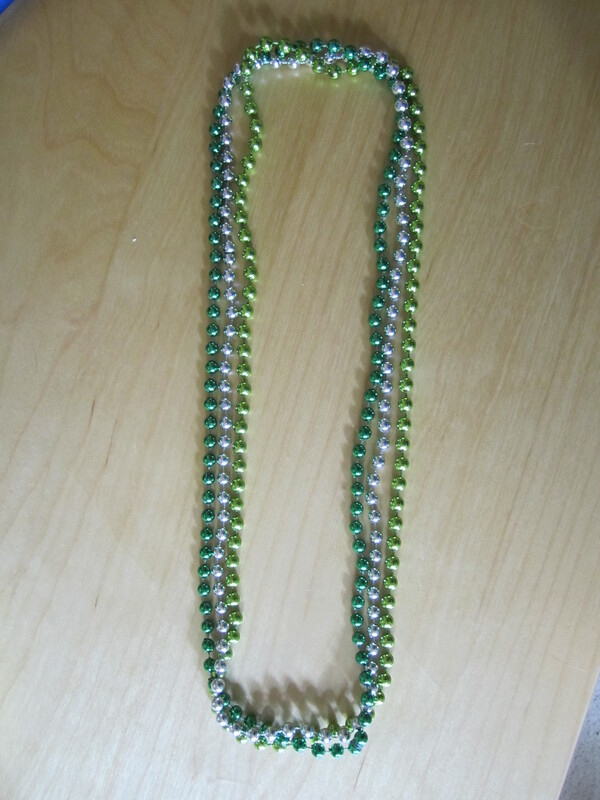 As many of you who read this blog already know I handed out “Blogging Beads” to those who write a genealogy blog. I wasn’t sure how many I would get. My blog and Twitter promotions highlighted a few people who were bloggers and attending conference. A few found me during the conference and I found a few others. This tradition was started by Thomas MacEntee of Geneabloggers. I asked him if I could start the same tradition at the OGS 2015 Conference in Barrie and he kindly agreed. We had the pleasure of Thomas’ attendance at the conference as a speaker for both OGS and OCAPG. I like to make sure I give him the first set of beads so he got his on Thursday. Then I started hunting for bloggers! If you received beads and are not on the list please contact me and you will be added to the list. If you were at conference and our paths never crossed please leave a comment below with a link to your blog and I will update the list. Here is a list of bloggers who received beads this year. You will also find a link to their blogs so please go and visit them. There are over 700 of you registered to attend the Ontario Genealogical Society Conference, “Genealogy on the Cutting Edge,” in Toronto from June 3rd to 5th. Do you blog about your family history? Well if you are going and do blog then keep an eye out for me. 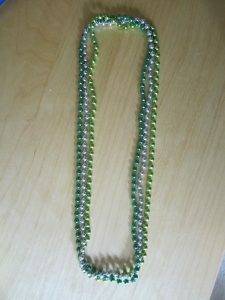 I will be handing out beads to all the bloggers I find at Conference this year. If you are going to conference and have a blog then please leave a link in the comments below. Let’s see how many new genealogy blogs we can find and follow. If you don’t blog but are considering it, then come and have a chat. I will be happy to give you some tips and ideas to help you start blogging. If you haven’t registered for Conference please consider joining us. It is a wonderful gathering of people who share the passion of family history research.